The PRE-tribulation view maintains that those who are TAKEN are Christians who are taken to heaven for the marriage supper of the Lamb and therefore those TAKEN shall escape the great tribulation period, while those LEFT BEHIND will have to go through the great tribulation. However, this is NOT what the Bible teaches what this verse means. Let's keep this verse in the context of where it is found and let the Bible interpret itself. "But of that day and hour knows no man, no, not the angels of heaven, but my Father only. 37. But as the days of Noe (Noah) were, so shall ALSO the coming of the Son of man be. 38. For as in the days that were before the flood they were eating and drinking, marrying and giving in marriage, until the day that Noe (Noah) entered the ark. 39. And knew NOT until the flood came, and TOOK them all away; so shall ALSO the coming of the Son of man be." Notice here that Jesus is comparing his COMING to the days of Noah and says, "as in the days of Noah so shall ALSO be the day of the Son of man", when he comes again. People in Noah's day went about living their lives taking NO heed to Noah's preaching. Jesus said they went about eating and drinking as if nothing were going to happen and they KNEW NOT or refused to believe UNTIL the flood came and TOOK them all away to destruction. You see, here in the days of Noah it is the WICKED who were TAKEN and destroyed and the RIGHTEOUS who were LEFT ALIVE and REMAIN. Now look at the passage of scripture that is use to teach the rapture or being caught up into heaven to meet the Lord in the air. Please read 1 Thessalonians 4:15, which teaches us that there will be Christians who have SURVIVED and have REMAINED ALIVE unto the COMING of the Lord. "For this we say unto you by the word of the Lord, that we which are ALIVE and REMAIN unto the coming of the Lord...."
The word “remain” here means to be LEFT. In other words, those Christians who are LEFT ALIVE or those who have REMAINED ALIVE will not prevent or go before those who have died in Christ, but TOGETHER we will all be changed in a twinkling of an eye and then be CAUGHT UP into the AIR to be GATHERED TOGETHER by the angels and then taken to MEET Jesus in the AIR over the place called ARMAGEDDON to execute the vengeance and WRATH of Almighty God. The wicked are going to be TAKEN and destroyed just like it was in the days of NOAH when Jesus returns, while the RIGHTEOUS will be LEFT ALIVE and kept safe just like in the days of NOAH. 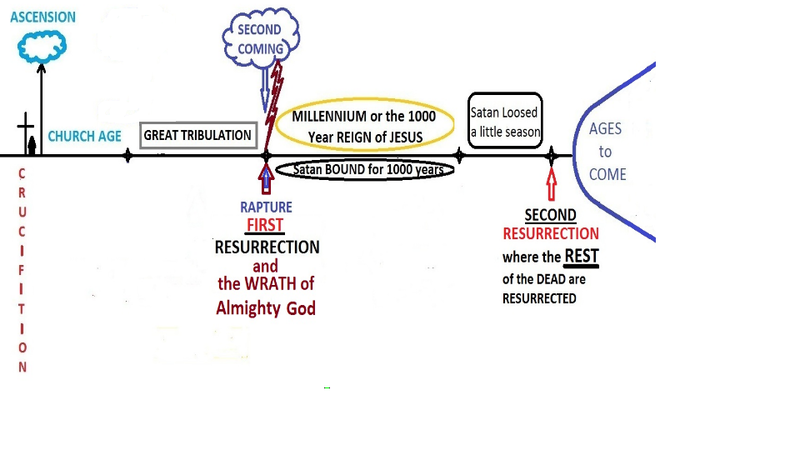 But the PRE-tribulation doctrine FALSELY teaches that those LEFT are LEFT BEHIND to endure the time of GREAT TRIBULATION, and the ones TAKEN are the church who are supposedly taken up to heaven for 7 years to eat the marriage supper of the Lamb and receive the reward or crown of eternal life, which totally contradicts what the CONTEXT of the verse in question teaches us. Look at Matthew 13:24-30 where Jesus tells us what the kingdom of God is like. "...The kingdom of heaven is likened unto a man which sowed GOOD seed in his field: but while the man slept, his enemy came and sowed tares among the wheat, and went his way. But when the blade was sprung up, and brought forth fruit, then appeared the tares also. So the servants of the householder came and said unto him, Sir, did not you sow good seed in your field? From whence then has it tares? He said unto them an enemy has done this. The servants said unto him, Will you then we go and gather them up? But he said Nay; lest you gather up the tares, you root up also the wheat with them. Let them both grow together UNTIL the HARVEST: and in the time of the harvest I will say to the reapers (the angels), gather you together FIRST the TARES, and bind them in bundles to burn them: but gather the wheat into my barn." "Then Jesus sent the multitudes away, and went into the house; and his disciples came unto him, saying, Declare unto us this parable of the tares in the field. He answered and said unto them, He that sows the GOOD seed is the Son of man; The field is the WORLD; the good seed are the children of the kingdom; but the TARES are the children of the WICKED one; The enemy that sowed them is the devil; the HARVEST is the END of the world; and the reapers are the angels. As therefore the TARES are gathered and burned in the fire; so shall it be in the END of this world. The Son of man shall send forth his angels, and they shall gather out of his kingdom all things that OFFEND, and them which do INIQUITY; and shall cast them into a furnace of fire; there shall be weeping and gnashing of teeth. THEN (after the wicked are gathered and destroyed by fire) shall the RIGHTEOUS shine forth as the sun in the kingdom of their Father. Who has ears to hear, let him hear." Notice that Jesus said the TARES are the WICKED, and then notice that the TARES or that is to say the WICKED are TAKEN FIRST to be burned and that RIGHTEOUS are LEFT ALIVE and THEN are gathered together into the kingdom of their Father. So you see, those that teach the PRE-tribulation view of the rapture have NOT correctly divided the word of God, when they try and say that those who are TAKEN are the righteous and the others are LEFT BEHIND to go through the great tribulation period. "I tell you in that night there shall be two men in on bed; one shall be TAKEN, and the other shall be LEFT. Two women shall be grinding together; the one shall be TAKEN, and the other LEFT. Two men shall be in a field; the one shall be TAKEN, and the other LEFT." "And they answered and said unto him. WHERE Lord?" "Wheresoever the BODY is, there will the EAGLES be gathered." What a seemingly peculiar answer that Jesus gave to his disciples about where they are taken. What does Jesus mean by this seeming odd answer that he gave his disciples and us to the question of WHERE Lord will they we TAKEN? So then, to WHOM do the BODIES belong to which were TAKEN or killed? And to WHOM does the EAGLES refer to that will be GATHERED? Now if you cross reference this verse through the Bible you will find that Jesus is referring to the CARCASSES of the WICKED who were slain at the COMING of Jesus. "Likewise also as it was in the days of Lot; they did eat, they drank, they bought, they sold, they planted, they built; but the SAME DAY that Lot went OUT of Sodom it rained fire and brimstone from heaven and destroyed them all (speaking of the destruction of the WICKED in Sodom). EVEN THUS (or EVEN in the SAME WAY) shall it BE in the day WHEN the Son of man is revealed." Notice that it says the SAME DAY that fire and brimstone rained down from heaven and destroyed all the WICKED that were in Sodom that it was the very SELFSAME DAY that Lot went out of Sodom. And Jesus said that this is the way that it will be in the day of the Son of man when he is revealed or comes again. On the very SAME DAY God will destroy all the WICKED by FIRE, but the RIGHTEOUS will be LEFT ALIVE and REMAIN unharmed by the fire at his coming again. Now I know this is backward to what a great many of us have been taught from those that teach the PRE-tribulation point of view, but this is a VITAL TRUTH that you must embrace IF you do not want to be in the number whose hearts FAIL them for fear of the things coming upon the earth. The Church, that is to say all believers are going to go THROUGH the ENTIRE period of the GREAT TRIBULATION. This is what the word of God without a doubt teaches. I have shown that the POST tribulation RAPTURE of the CHURCH to be SOUND BIBLICAL DOCTRINE based solely upon the word of God in the study entitled “THE GREAT TRIBULATION”. Then IMMEDIATELY AFTER the great tribulation Jesus will send his angels to gather the elect, that is to say the RIGHTEOUS to the place called Armageddon to meet out judgment upon the wicked. "Behold I come as a thief. Blessed is he who watches, and KEEPS his garments, lest (or for fear that) he walk naked, and they see his shame. And he GATHERED them together into the PLACE called Armageddon.?" This is what the BIBLE refers to as the “marriage supper of the Lamb” as Revelation 19:7 clearly describes, and NOT what the traditions and doctrines of man have contrived in their IMAGINATIONS of a 7 year long wedding feast up in heaven, while the great tribulation was being carried out upon the earth. Now for those who have “itching ears” and do not want to endure SOUND doctrine in these last days, those vain IMAGINATIONS and false dreams of escaping the great tribulation by spending that time at the so called “wedding feast” does sound more pleasing to the ear, BUT be assured that the interpretation of a PRE-tribulation is a doctrine of the devils. Please read Revelation 19:7 to discover the TRUTH. "Let us be glad and rejoice, and give honor to him: for the MARRIAGE of the Lamb is come, and his wife has made herself READY." "...And he cried to all the fowls (eagles) that fly in the midst of heaven, come gather (there will the eagles be gathered) unto the SUPPER of the great God." Now compare Matthew 24:28 with Luke 17:34-37 where the WICKED are TAKEN and destroyed and the EAGLES are GATHERED together to eat their carcases or their flesh. The Bible likens the BELIEVERS to be EAGLES. "You have seen what I did to the Egyptians, and how I bare you on EAGLES' wings, and brought you unto myself." Now for one to understand that this battle that is to take place at the end of days to be the MARRIAGE SUPPER of the Lamb, then one needs to understand the sweet taste of VENGEANCE. I know this does not sound very Christ like, but God does not forget our persecution that we as Christians have and will yet endure in the great tribulation. "And I heard another voice from heaven, saying, Come out of her (the sin filled world) my people, that you be NOT partakers of her sins, and that you receive NOT of her plagues (the WRATH of my vengeance). REWARD her EVEN as she has rewarded you, and DOUBLE unto her DOUBLE according to her works: in the cup she has filled fill to her DOUBLE." The word “reward” here means to recompense, or to PAY BACK. Now what does the word vengeance mean to you? Yes, it is PAY BACK time! Now the actual vengeance belongs to the Lord, but we are going to be there at his side executing vengeance. "Let the SAINTS be joyful in glory: let them sing aloud upon their beds. To execute VENGEANCE upon the heathen, and punishment upon the people." "To execute upon them the JUDGMENT WRITTEN: this HONOR have all the saints. Praise you the Lord." We, the SAINTS of God, will be changed in a moment and a twinkling of an eye when the Lord returns and then we will all be GATHERED TOGETHER like the EAGLES to a place called ARMAGEDDON to execute vengeance upon those who have persecuted us and have slain or beheaded some of us. We will reward or REPAY to them DOUBLE what they did to us. This is the PATIENCE of the saints. "Behold I come as a thief. Blessed is he that watches, and KEEPS his garments, lest he walk naked, and they see his shame. "...Come GATHER yourselves together unto the SUPPER of the great God. That you may eat the flesh of kings, and the flesh of captains and the flesh of mighty men..."
One has to remember that the language of the book of Revelation is in part symbolic in nature, meaning that we do not actually eat the FLESH, but rather take part in the slaying of the wicked. This will be our “meat”, so to speak. Food to our souls, if you will. So in closing, the ones who are TAKEN are the wicked to be destroyed by fire, the lake of fire. And the ones LEFT are the RIGHTEOUS who are LEFT ALIVE and REMAIN ALIVE at the time of the coming of the Lord at the RAPTURE. Then we will be gathered together from the four corners of the world along with the dead in Christ who the Lord brings back with him, and all the SAINTS will be TAKEN to the battle of Armageddon to execute vengeance. And this is known as the MARRIAGE SUPPER of the Lamb. May the Holy Spirit lead and guide you in all TRUTH so that you will be READY for the coming of the Lord.